At Allied Irish Bank (GB) we take security seriously. We aim to protect you against the threats associated with internet fraud. Here, you will find details of specific current security threats to our online banking customers and alerts that you should be aware of. If you feel you have been affected by this type of fraud or any other scam, call Us on 028 9034 6034 (8:30am to 17:00pm Mon to Fri) or email us at alert@aib.ie. We are aware of attempted fraud on iBB; screens that look like iBB screens are being used in an attempt to trick customers into making fraudulent payments. Allied Irish Bank (GB) will NEVER ask you to key codes, presented to you on a screen, in to your Digipass. Please remain vigilant of fraudulent activity. How do you know that you are under attack? Your PC slows down while using iBB – particularly at logon. Suspicious phone calls are received purporting to be from Allied Irish Bank (GB) regarding iBB – asking you to create codes on your Digipass, perform test payments and/or authorise payments. Remember: Always check that the Beneficiary details for payments you are authorising are legitimate. 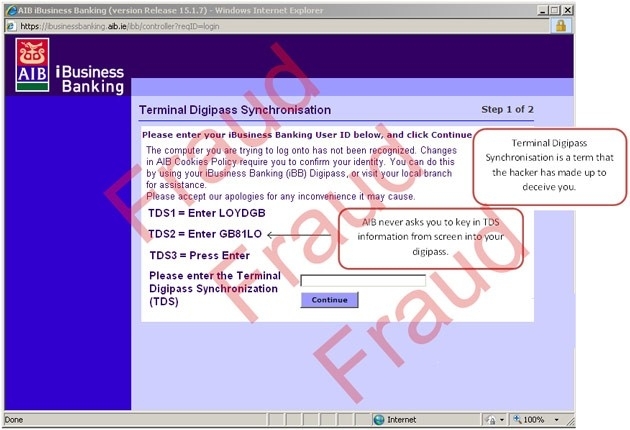 While the screen below may look authentic, it is an example of a fraudster attempting to get security information from you to make a fraudulent payment.